Direct Manipulation Video Navigation (DMVN) systems allow a user to directly drag an object of interest along its motion trajectory and have been shown effective for space-centric video browsing tasks. This paper designs touch-based interface techniques to support DMVN on touchscreen devices. While touch screens can suit DMVN systems naturally and enhance the directness during video navigation, the fat finger problems, such as precise selection and occlusion handling, must be properly addressed. In this paper, we discuss the effect of the fat finger problems on DMVN and develop three touch-based object dragging techniques for DMVN on touch screens, namely Offset Drag, Window Drag, and Drag Anywhere. We conduct user studies to evaluate our techniques as well as two baseline solutions on a smartphone and a desktop touch screen. Our studies show that two of our techniques can support DMVN on touch screen devices well and perform better than the baseline solutions. Cuong Nguyen, Yuzhen Niu, and Feng Liu. Direct Manipulation Video Navigation on Touch Screens. Cuong Nguyen and Feng Liu. Gaze-based Notetaking for Learning from Lecture Videos. Cuong Nguyen, Wu-chi Feng, and Feng Liu. Hotspot: Making Computer Vision More Effective for Human Video Surveillance. Cuong Nguyen and Feng Liu. Making Software Tutorial Video Responsive. Cuong Nguyen, Yuzhen Niu, and Feng Liu. 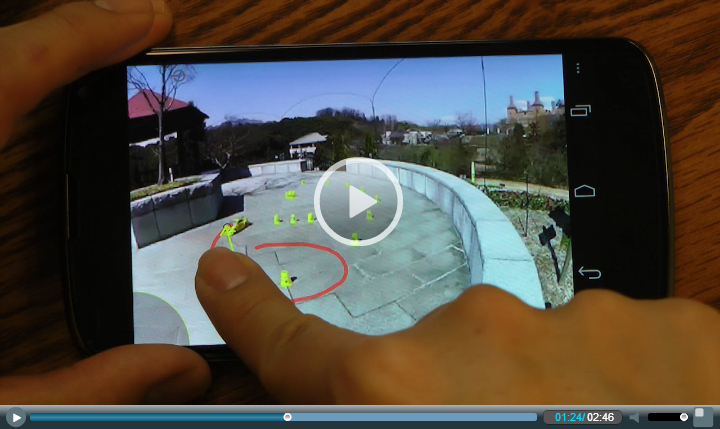 Direct Manipulation Video Navigation in 3D. Cuong Nguyen, Yuzhen Niu, and Feng Liu. Video Summagator: An Interface for Video Summarization and Navigation. The video from YouTube user MSPDawgs is used under a Creative Commons license. This video was narrated by Hugh Owens. This work was supported in part by NSF grants IIS-1321119, CNS-1205746 and CNS-1218589. Yuzhen Niu is supported by NSFC 61300102.